MMD to SFM port from this lovely MMD model of "Ramesses II", from the Chinese videogame "Moeoh Ex". Before anything else, let me give a very big hug to Horsey, uwotinfokm8 and esk-0 for making this port possible. Without them i wouldn't have been able to do it. THANK YOU VERY MUCH! You can set phongboost and phongexponent attributes on the materials to make the body look wet. Little warning here: the body is divided on several textures, so if you want to set the "body", you need to modify "body mune" (breasts), body and body2 (because the model has several tatoos, the model is divided vertically). You have to edit body3 and body4 respectively if you're using the second skin (without tatoos). It happens something similar with her hair: you need to change hair01 and hair02. The model has around 200 bones on her hair/skirt (good luck with this lol). See more information below. Includes a rig called "rig ramesses", so you don't need to create one. Included a script called "revzin assemble autoload" to assemble her skirt easily. See more information below. This model has A LOT of bones: 363 in total, and very few of them could have been deleted. 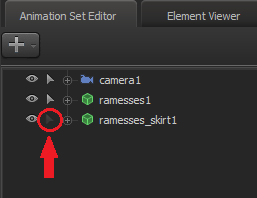 Since SFM only allows a maximum of 256 i had to split the model in 2: The main model "Ramesses" and the Skirt (left, right and back side): "Ramesses Skirt". Both includes bodygroups to remove the jewelry. To attach the skirt to the main body you could drag the "bip hips" bone from the main body to the skirt's "bip hips" bone and then set the "Zero" slider to 1, but it can be done way more easier. For that, i included a script called "revzin assemble autoload" that must be placed on the same folder than the rigs (.../scripts/sfm/animset/). If you extract the file as it is you shouldn't have any issue. This script designed by Revzin (you can see more info here) will load the skirt directly on the model. You won't need to do anything else. Load the main model "Ramesses"
Right click on her name. Select "Rig" -> "revzin assemble autoload"
Since the model has a lot of bones for her skirt/hat/jewelry, i created new groups for the bones. This is configured on the file called "sfm defaultanimationgroups" located in "...\SteamApps\common\SourceFilmmaker\game\usermod\cfg". Make a copy of your file for safety, since mine will override it. The new groups included are: Circle, Chains, Tassels, Long-Hair and Ramesses-Skirt. It also includes the "Nine-Tails" group from my Ran Yakumo models. If you don't modify this file, the bones will be inside the "Unknown" group, which may make things a bit annoying to handle, since there are A LOT of bones. The socks may clip with the skin of her legs. This is an issue with the MMD model itself and i couldn't fixed it. It's easily avoidable if you don't try to make weird angles with her feet (entirely avoidable if you remove the "socks" bodygroup). The front/back "chains" (no idea how to call them... it's the decoration "pending" on the jewelry on her waist) doesn't have bones like the ones on her chest (left/right)- They're part of the front/back skirt itself, so if you want to move them, you need to move the skirt (it looks kinda bad, so it can be removed with the "jewelry skirt front" and "jewelry skirt" bodygroups if needed). @DevilsCry Any chanced you'd record how you go about porting the models? I've tried my hand a couple times and it's never gotten out of blender. THANK YOU! I've been searching for so long to find similar gold body jewelry, stirrup-ed socks, & accessories for my own personal projects and here they are in which i couldn't have enough of. What a relief! Not to mention a fantastic job on the model. Nov. 23, 2016, 6:13 p.m.
Nov. 25, 2016, 1:27 p.m.